Nagano's Own Oyaki Dumplings Cooked on Coals on a Hearth. 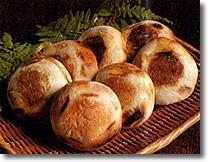 Mountainous Nagano has a lack of land suitable for growing rice, hence a tendency for flour-based cuisine with oyaki dumplings being a prime example. Ogawa-no-sho's oyaki chefs roll the flour into shells as soft as earlobes, season it with miso and soy sauce and add seasonal vegetables, then steam or grill them as is the fashion in northern Nagano. The shop's specialty are its Jomon Oyaki grilled over coals at the irori hearth as has been done since prehistoric times. From Nagano IC, Follow the signs to Zenkoji Temple, approx. 30 min. Located along Chuo Dori street.